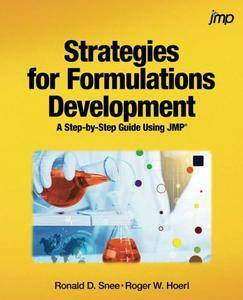 Strategies for Formulations Development: A Step-by-Step Guide Using JMP is based on the authors' significant practical experience partnering with scientists to develop strategies to accelerate the formulation (mixtures) development process. The authors not only explain the most important methods used to design and analyze formulation experiments, but they also present overall strategies to enhance both the efficiency and effectiveness of the development process. Approach the development process from a strategic viewpoint with the overall end result in mind. Design screening experiments to identify components that are most important to the performance of the formulation. Design optimization experiments to identify the maximum response in the design space. Analyze both screening and optimization experiments using graphical and numerical methods. Optimize multiple criteria, such as the quality, cost, and performance of product formulations. Design and analyze formulation studies that involve both formulation components and process variables using methods that reduce the required experimentation by up to 50%. Linking dynamic graphics with powerful statistics, JMP helps construct a visually compelling narrative to interactively share findings that are coherent and actionable by colleagues and decision makers. Using this book, you can take advantage of computer generated experiment designs when classical designs do not suffice, given the physical and economic constraints of the experiential environment. 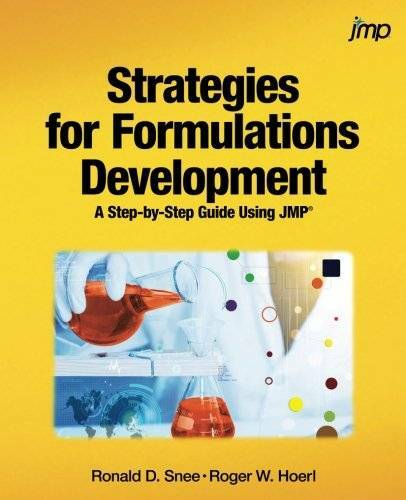 Strategies for Formulations Development: A Step-by-Step Guide Using JMP is unique because it provides formulation scientists with the essential information they need in order to successfully conduct formulation studies in the chemical, biotech, and pharmaceutical industries.